ODROID-W: Hardkernel are more known for their Exynos based single board computers which pack quite a punch in a small space – enough that a meaty heatsink is needed. But their latest product eschews the Exynos chippery for a Broadcom chip, the same chip as the Raspberry Pi. The ODROID-W is apparently the result of a wearable research project which saw Hardkernel minimise the Pi design down to a wearable module. This module loses Ethernet, switches to a MicroSD slot and micro-HDMI then adds an eMMC socket, real time clock and battery booster and packs it into a tiny board. It’s rather neat and if you want more ports, there’s docking modules with or without touch TFT LCD screens. It’s one of the more interesting additions to the Pi ecosystem and I’ll have more to say about it when they arrive at Codescaling. ODROID-VU: While looking at the Odroid-W, I noticed the Odroid-VU. This is a 1280×800 9″ multitouch display with USB and HDMI connections which seems to be joining the race for who can make the all-purpose hacker-maker portable screen. BeagleBone Black GPIO: BeagleBone Black’s have a lot of IO capabilities and it can be a bit daunting taking it all in. So Kilobaser’s BBB GPIO tutorial is a great place to get a handle on all these pins and how to control them from Linux. BeagleBone Black Tutorials: Another useful resource is Logicsupply’s Inspire blog where various handy articles have been appearing like this one on how to drive OLED displays fromC/C++ or making Xbee work or this one on web controlling LEDs using a smartphone. 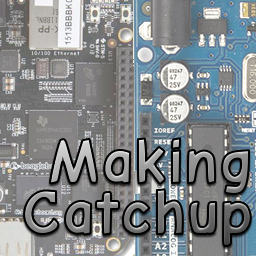 ‹ PreviousMaking Catchup: Pi Gameboys, Free routing, Easy IoT service and a robot dinosaur!